A predator-killing contest scheduled for next week near Salmon is offering $1,000 prizes for the biggest wolf killed and for the most coyotes killed. The two-day contest, beginning Dec. 28, is hosted by Idaho for Wildlife, a hunters and anglers organization with six chapters throughout the state, and is being sponsored by 21 Salmon-area businesses. According to the organization’s website, pools are being solicited for prizes for largest male coyote, largest female coyote and most female coyotes. Prizes will also be awarded in categories for 10- to 11-year-old and 12- to 14-year-old contestants. The entry fee is $20. The website states that hunting will be allowed to take place on public land and on private land with permission. All state fish and game rules will apply. Idaho classifies wolves as a big-game animal, which means that hunters must obtain a wolf tag and hunt only within a set season. In the Salmon zone this year, the wolf season is from Aug. 30 to March 31, and the zone has a quota of 45 wolves. As of Tuesday, the Department of Fish and Game reported only five wolves killed in the zone this season. Hunters can buy two wolf tags for use in that zone. Coyotes are classified in Idaho as predators, and hunting the animals is unregulated. 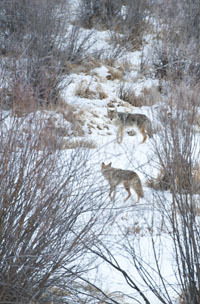 According to the Department of Fish and Game, trappers killed 3,468 coyotes in 2011-12. During fiscal year 2012, the federal Wildlife Services agency killed 3,120 coyotes in Idaho in an effort to reduce livestock depredation. The contest near Salmon is similar to “predator derbies” that have been organized over the past few years by Idaho Sportsmen for Fish and Wildlife near Twin Falls and Boise. Idaho Department of Fish and Game spokesman Mike Keckler said the department has not provided any material support for any predator killing contests. The department’s Predator Management Policy states that it will “not support any contests or similar activities involving the taking of predators which may portray hunting in an unethical fashion, devalue the predator, and which may be offensive to the general public.” Keckler refused to comment on whether the department views contests such as the one scheduled for Salmon as fitting that description. He said the department does support predator management. “We always view the control of predators to be helpful,” he said. Tom Keegan, Department of Fish and Game regional wildlife manager in Salmon, said coyotes in the area prey mostly on mice, voles and rabbits, though they do eat deer and antelope fawns in the spring when rodent populations are low, and a few coyotes eat the fawns as a preferred prey. He said he doubted the contest would have much impact on the area’s coyote population. Idaho Wildlife Services State Director Todd Grimm said his agency is frequently called to the Salmon area during the summer to kill wolves involved in cattle depredation. However, he said complaints of coyote depredation are rare because there are not many sheep raised there. “Cattle are only vulnerable to coyotes for a couple of weeks a year during calving season,” he said. Linda Price, manager of the BLM’s Salmon Field Office, said Idaho for Wildlife will need to obtain a special recreation permit to hold any part of the contest on BLM-managed land. A federal regulation requires a special-use permit for events that take place on national forests and charge an entry fee. However, Salmon-Challis National Forest Public Affairs Officer Amy Baumer said the Forest Service is not requiring a permit for the contest because it does not involve a particular place on the forest and because hunting is regulated by the Idaho Department of Fish and Game. The upcoming contest, like its predecessors, has been condemned by organizations that support wild canines. “Hunting for sustenance is sensible, but killing for fun is a waste of precious life with no supportable purpose or value,” said Garrick Dutcher, program manager for the Ketchum-based nonprofit Living With Wolves. “A competitive killing contest of two of nature’s magnificent creations reflects a regrettable lack of understanding. Wolves, coyotes and all other native wild predators and scavengers belong to a functioning ecosystem. They fulfill critical roles, keeping elk and deer herds vigorous and alert by eliminating the diseased animals and the weakest genes. Fox said her organization is aware of at least 50 contests to kill coyotes and other animals that are taking place in various states this fall and winter, and she is not aware of any state that bans such contests. A bill to do so was introduced in the New Mexico House of Representatives last year but failed by a vote of 38-30. Fox said another version of the bill will be introduced there this winter. She said she doubts such a law will be passed anytime soon in Idaho. “It’s a challenging state to make inroads on wildlife conservation issues,” she said.